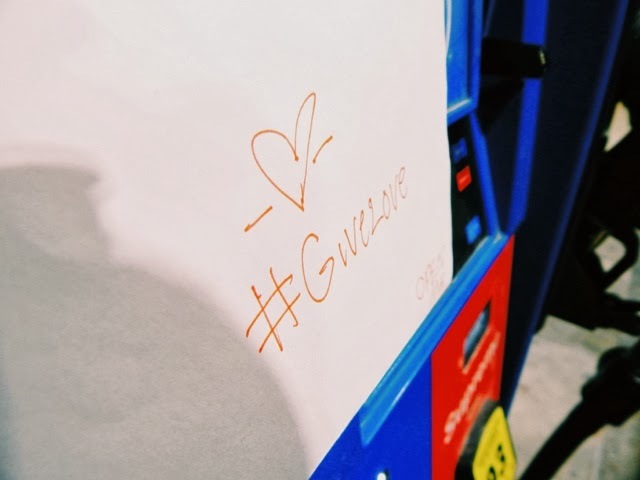 #GiveLove has been in swing for one week. *Everybody claps and says amen* Well, I'll pretend y'all did. Anyway, let's see where I've been leavin' letters. Let me know If y'all have left any letters or happen to find any of my letters. And at the end of le post you can find a giveaway I'm helpin' host. Y'all go get ya some and let's remember to spread some love this weekend. Cool idea! It reminds me of http://www.moreloveletters.com/ . What is the give love campaign? Yes ma'am. I wa recently reading a blog that lead me to that website and I used it for some tips and tricks. I'm having fun with this and might do it again later in the year. yes, it reminds me of More Love Letters, too! :) Great idea, I like it! Thanks Ashley. It deff is a feel good type of thing that I'm having fun with. If that made any sense?!? Wow...you pick some interesting places. Though I guess if I was in a porta potty I could use some cheering up. I love that you're doing this! Oh, and my favorite thing about winter is when it's OVER! Ugh. The places you picked were cool and out in the open. I think I was more embarrassed to leave it somewhere so I left it hidden. I could try it again and put it in a seen place. That's such a neat idea, I would be super excited to find something like that! My favorite thing about winter is Christmas. But now that it's January, I'm ready for spring! Sounds like a great way to honor your mother. Hi Aleshea! Thank you for your sweet comment on my blog. I think your #GiveLove project is absolutely amazing. I'm following along via Bloglovin because I can't wait to see more of the love you're spreading! My favorite part of the winter is my boots--it doesn't get too cold here in Charleston, so I'm excited anytime it's chilly enough to pull on my favorite pair of boots! Neat project! Reminds me a lot of http://www.operationbeautiful.com/ but with a different spin, thought you might be interested in that too. Thanks Skye. I will be looking into this. So I looked and I love it. I'll be submitting as soon as #givelove Is over and I get a spare moment. Alesha, I love this idea! It's so fun to see all the places you've left notes. I'm glad you showed the inside of one, because I was really starting to get curious! Hope you bring some #givelove notes to Helena!